Unfortunately scuds are not on most flyfishers´list of top patterns, quite to the contrary, they are practically ignored. Scuds, however, are available all year long. 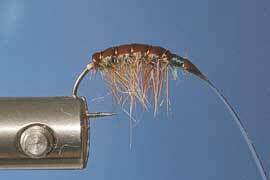 Some fisheries practically teem with scuds. Their hight carotene content is responsible for the red color of the meat of many fish. An example: maritime salmon have groups that feed mostly on fish and others that feed on shrimp. The fist group has very light meat whereas the meat of the shrimp-feeders is nice and red. Unfortunately carotene is administered to artificially raised fish to make them look as though they had spent their lives naturally feeding on healthful crustaceans. Scuds don`t belong to flies or nymphs, but are shrimp, they are fished the same way nymphs are. In flyshops you will find them next to nymphs. Especially in the months from November to March fishing them may bring you pleasant surprises. They´re a must in any flybox. Fly tying instruction how to tie scuds, with Wolfgang Fabisch. 1. 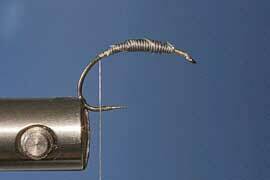 First, after applying a little superglue, wrap your hook shank with lead wire. The second layer of lead should leave about five turns of the first layer exposed at both ends. 2. 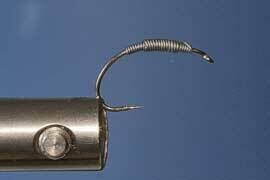 Now you wrap hook-shank and lead with your tying thread. 3. 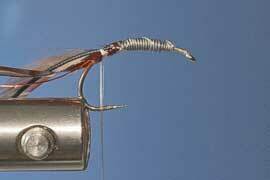 Next you tie in your materials near the rear end of the hook-shank. As a rule, you tie in first what you intend to use last. So here, tie in first the ribbing wire, then a strip of latex approximately 4mm (.16 inches) wide. 4. 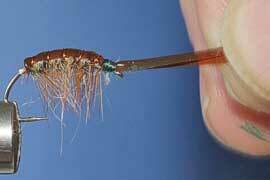 As last item, tied in a hackle , which you need it to build the legs. 5. 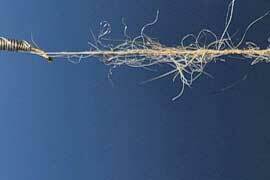 Now split your thread with a needle, insert a little dubbing, and twist. 6. Then hide your lead wraps under the dubbing. 7. 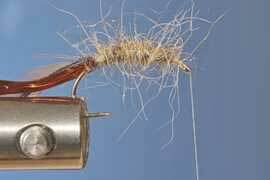 Next take your hackle and wrap it in four to five turns to the hook eye. 8. 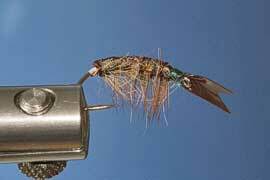 Clip your hackle and dubbing on the top side of your scud. 9. Now fold your latex strip forward and tie it down right behind the eye. Take care to avoid too much tension on the latex! 10. 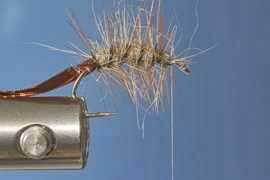 Next, rib your fly with the wire you have tied in. Five wraps should do it. 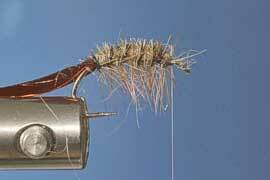 Tie down wire and clip it. 11. If you prefer, you may now color your thread to your liking, and make a whip-finish. 12. Don´t cut the remaining latex flush with the hook eye! Instead fold it as shown on the photograph and pull it lightly, than make a slanted cut from the hook towards your fingers. 13. 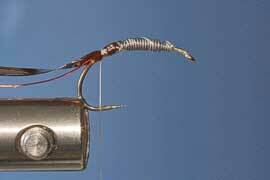 This way you get a nice tail extending beyound the hook eye.